The undersigned is to refer to Ministry of Urban Development’s OM No. 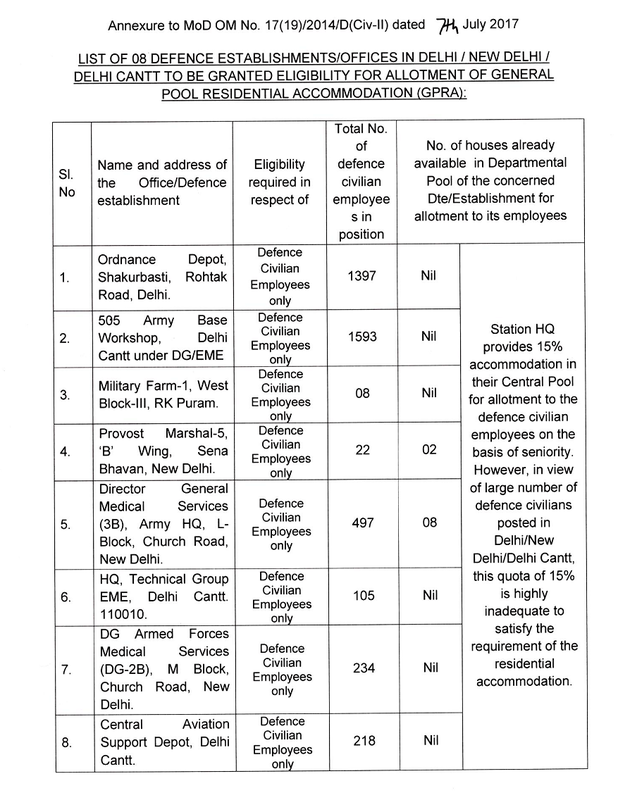 12033/4/67-Pol.II dated 3rd, October, 1969 on the subject – “Eligibility of the staff of Central Government Office for allotment of residential accommodation from the General Pool-Criteria regarding’ and to say that a number of defence civilian employees working in many Defence establishments located in Delhi/New Delhi/Delhi Cantt are not able to avail the facility of GPRA for the reason that their offices have not been declared “eligible offices” for allotment of GPRA allotted by Directorate of Estates (DoE). The small quota of 15% of residential accommodation of the Defence/Army Pool is grossly inadequate and therefore it causes extreme hardship to the defence civilian employees who have to make their own arrangement for residential accommodation.